Plot: A group of Yokohama teens look to save their school's clubhouse from the wrecking ball in preparations for the 1964 Tokyo Olympics. From Up On Poppy Hill should reassure fans that the Hiyazaki legacy is in safe hands. Studio Ghibli’s magic is a fey and insubstantial thing. It can’t be stamped, filed, indexed or codified but it’s unmistakable. So when, last week, Studio founder Hayo Hiyazaki announced that he was retiring, anime aficionados held their collective breaths. Ghibli animations are always beautiful but it’s those that Hiyazaki has written and directed – My Neighbour Totoro, Kiki’s Delivery Service, Princess Mononoki, Spirited Away and Howl’s Moving Castle – which seem to have that indefinable magic. From Up On Poppy Hill isn’t a Hayo Hiyazaki production but it is the next best thing, having been directed by Hayo’s eldest son, Goro. Set in post-war Yokohama, From Up On Poppy Hill follows the story of an innocent romance between high school students Umi and Shun. The two are pretty serious-minded individuals. Umi keeps house for her absentee mother, while Shun is a member of the Journalism Club. 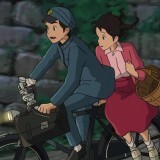 But then, this is a Studio Ghibli film not a Disney ‘product’ so we don’t all have to be sassy, loud and popular. It’s OK to be a bit of a geek. The story is beautifully told allowing us get to know – and care – about the young protagonists. The result is that, when a secret threatens to shatter their burgeoning friendship, we share their pain. The tale takes its own sweet time but the conclusion is ultimately satisfying without any smaltzy sensationalism. However, Poppy Hill’s real star here is the animie’s lavish visuals. 1963 Yokahama is a big, bustling seaside town, filled to the brim with chattering, chuckling humanity in all its wonderful variety. The harbour is alternately sun-drenched and mist-shrouded. The streets are a riot of colour and shade. The markets groan with Japanese street food, which will have you drowning in your own drool. Once again, Ghibli’s wonderful watercolour sketches make watching an intense and immersive experience. 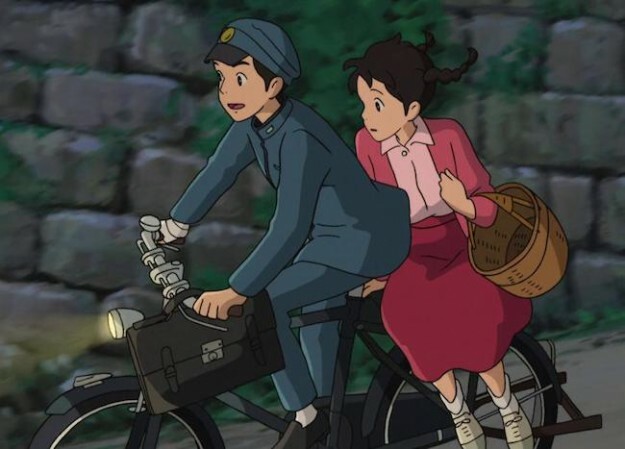 Fans of Spirited Away and Howl’s Moving Castle may find the pace of Poppy Hill a little slow and the story lacking in the ‘fantastical’. But this is old school Ghibli at its very best and proof – if it were needed – that Goro is indeed his father’s son. From Up On Poppy Hill should reassure fans that the Hiyazaki legacy is in safe hands.